"It's only been 4 hours and the diaper is leaking...."
After nearly 30 years in the cloth diapering business, I've heard it all! And, the internet is making things worse, not better. I raised 4 children, changing and washing over 10,000 cloth diapers in the process. After the third child, I designed the first "one-size-fits-all" pinless, no-fold cloth diaper and started what is now the oldest and largest pinless pre-folded cloth diaper business in Canada. Because of our knowledge in this field, every day, parents turn to us with questions. With the internet as a resource, the once simple use of cloth diapers, has been made needlessly complicated. It's frustrating to hear from moms and dads who are having problems--even to the point where their babies are suffering--because they have read some stupid advice, or bought some badly designed diapers from the internet. Mothers who have a baby just a few months old seem to think they are qualified to hand out advice on the internet. Other mothers, lacking confidence in their own common sense, follow other people's silly advice. Some mothers who have a baby a few weeks old, seem to think they have designed the best diaper in the world and put it on the market without thoroughly testing it. Some of those diaper makers even seem to think they can change someone else's idea a little and then claim they have invented something new and better! With the internet, these shoddy products and bad advice trap new parents into wasting a lot of money, and causing babies discomfort even to the point of bleeding diaper rash. 1. Not changing the baby frequently enough is a mistake. Cloth diapers must be changed as soon as baby wets, if not, leakage and diaper rash will occur. Would adults like to sit in wet underwear for a couple of hours? Letting a baby sit in a wet diaper for hours is neglect and abuse! Even if you are shopping or travelling, STOP, and change the wet diaper. Parents who start off by using disposable diapers have been mislead by diaper companies to think that a diaper can be left on for 4-12 hours. 2. Not buying enough cloth diapers is a mistake. 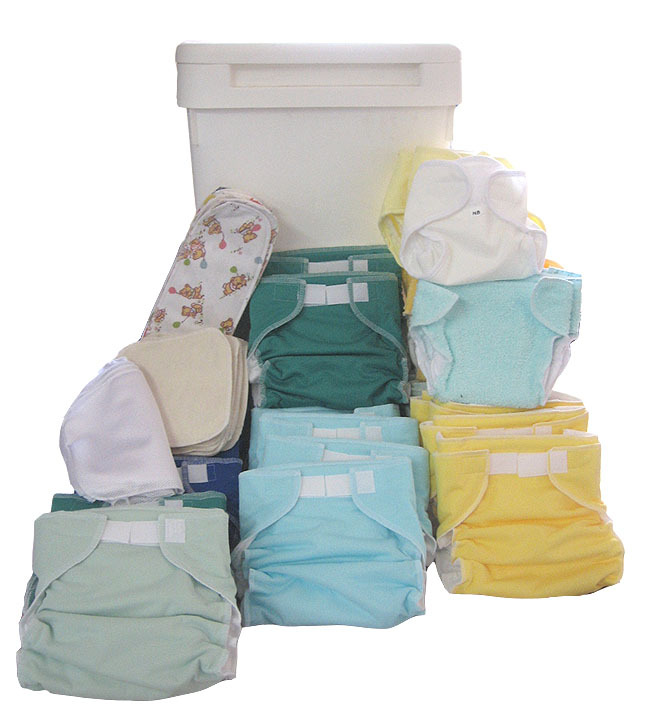 If you don't have at least 36 diapers, you won't be able to change baby after each wetting. You need at least 20 dry diapers while the others are going through laundering. If you get less than 36, they will wear out before baby is potty trained, because with fewer diapers, they will be laundered more frequently. 3. Using laundry products that damage diaper fabric or baby's skin is a mistake. Many detergents now include enzymes, bleach, scent, optic whiteners, color, fabric softener, and other chemicals that actually damage the diapers, remain in the fabric, and will cause diaper rash. Instead, use only natural products: 1/2 cup washing soda and 1/2 cup borax per load, easy and inexpensive. Don't use fabric softener. It leaves a residue in the fabric which eventually causes the diapers to be water-repellent. The scent and other chemicals in fabric softener also cause diaper rash. 1/2 cup white vinegar in the final rinse is a natural fabric softener and pH adjuster. Don't bleach your diapers--it eats away the fabric and the residue causes rash. 4. Buying diapers which use synthetic fabrics for the absorbent component is a mistake. Synthetics cause both immediate and long-term problems. Only natural fibers should be next to baby's skin. Cotton is a time-proven winner for absorbency and gentleness. Microfiber "hooks" even the most delicate skin--the "hooking" quality makes it suitable for dusting, not diapering! Fleece is HOT, hence it's use as "polar" fleece. Before you put cute, fuzzy fleece on your baby's bottom, think about how you would feel in fleece underwear on a summer day. Synthetic fabrics build up residue, eventually losing their absorbency--that's why you hear about people "stripping" their diapers. 5. Using "pocket" diapers. Instead of stuffing extra inserts into pockets for extra absorbency, just change the baby as soon as he wets. With pocket diapers, you will need to handle a poopy diaper to get the insert out before laundering. Stuffing pockets takes extra time. 6. Not washing diapers daily is a mistake. You won't have enough dry diapers on hand, and won't be able to change baby as soon as he wets. Diapers that sit in the diaper pail for more than a day start to smell, take longer to come clean, and stains set. Ammonia builds up so the laundered diapers will have a weird smell when baby wets, and your baby may get diaper rash. 7. Not rinsing off poopy diapers is a mistake. Yes, even those runny newborn breastfed poops MUST be cleaned off before they go into the diaper pail. Use diaper liners, or rinse the diapers by dunking or spraying them. Don't expect your washing machine to get the diapers clean if you throw poopy ones in there, especially if you let them sit for more than a day--yuck. Great grandma would be scandalized at that kind of laziness. Your washing machine is not a septic tank, and you do not want your regular laundry to be contaminated by diapering residue. For the same reason, don't use your washing machine to hold soiled diapers till laundry time--use a diaper pail. 8. Mistake: using COLD water to wash diapers, or using too small an amount of water. To be clean and sanitary, diapers must be washed in HOT water, and dried in a HOT dryer (or dried in the sun, which sterilizes with UV rays). Use plenty of water to be sure the diapers are thoroughly clean and rinsed. Pre-rinse and final rinse can be with cold water, but the main wash must be HOT! Parents tell us that the cheap made in China all-in-one diapers lose the waterproofing in the outer layer after just a couple of washes in hot water. If you are buying all-in-ones make sure the instructions say "hot water wash/ hot dryer". If you are using a detergent that works in cold water, you still need to use hot water for diapers. 9. Putting natural oils in the diaper pail is a mistake. Using precious tea tree oil, grapefruit seed extract, or aromatherapy oils for this purpose is wasting earth's natural resources, wasting your money, ineffective and even damaging for diapers. Some aromatherapy oils can cause adverse reactions when used inappropriately, as I've learned from experience. Oil residue on diapers will cause them to be water-repellent instead of absorbent. The amount of oil you put in the diaper pail is not enough to be significantly anti-bacterial. Don't waste these valuable oils in the diaper pail--instead, wash your diapers daily. 10. Expecting cloth diapers to look like disposables is a mistake. Disposables are very thin and narrow because the chemical crystals inside swell up when wet. Cloth diapers do not change shape when wet, so are designed to put absorbency where it is needed. This will not cause any discomfort to baby. In fact, for babies who have hips that are "out" from their delivery, doctors recommend double-diapering so that the thickness between the legs will put them in the froggy position in order for the hips to go back into place. You will cause problems for your baby by putting her into tight-fitting diapers, sleepers, or baby carriers that position the legs straight down. Cloth diapering is easy--just keep baby in a dry diaper, use a very simple laundry procedure every day, and question any advice you get from inexperienced diaper users.